As the reported second most common cause of back pain (following muscle strain), symptoms and signs of lumbar disc herniation (LDH) relate primarily to varying degrees of involvement of the first three symptom mechanisms above. 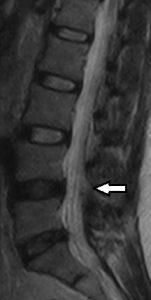 Determining the level of involvement, location and extent of herniation should enable more accurate correlation of clinical and imaging findings – keeping in mind that lumbar disc abnormalities are known to exist in up to 75% of people with no symptoms. Central, paracentral and subarticular locations comprise some 90% of herniations; 4-5% are foraminal; another 4-5% are extraforaminal, while anterior LDH is considered relatively rare. The spectrum and extent of LDH involvement include protrusion, extrusion and sequestration. Since the outermost annular fibres are not breached, protrusions are regarded as ‘contained’ lesions, in contrast to ‘non-contained’ extrusions/sequestrations that do ‘leak’ through the annular fibres. Magnetic resonance imaging is often the modality of choice for evaluation of spine-related complaints, given its ability to combine osseous, neural and soft-tissue elements in a single imaging procedure. Furthermore, recumbent/upright comparison MRI may demonstrate changes that are not detected with recumbent-only imaging . This may be seen in types of spinal stenosis related to the postural displacement of soft tissue structures and/or vertebral segments. MRI studies for spine, sports and activity-related conditions may be performed using scanners with differing magnetic field strengths – low, medium or high. As with all types of imaging modalities, each type of MRI scanner has strengths and limitations. In particular, while high-field (>/= 1 Tesla) images do appear crisper, this does not translate to increased diagnostic power in biomechanical imaging. This was demonstrated in a recent study of the diagnostic capability of low- versus high-field MRI for lumbar degenerative disease, published in Spine  – a cohort study involving 100 patients with neurogenic claudication or sciatica symptoms. The researchers considered low-field lumbar spine MRI to be very comparable to high-field MRI. This included excellent reliability between low- and high-field MRI for disc herniation and stenosis – canal, lateral recess, exit foramen. While there was good agreement for nerve compression, longer scan times with low-field may have contributed to slightly reduced correlation. As such, there is “little reason why (low-field) 0.25T imaging systems should not be used to routinely investigate the degenerative lumbar spine.” Anecdotally, in personal communication, this accords with the views of several radiologists, neuro- and orthopaedic surgeons. L4/L5 – Moderate degenerative disc signal reduction and mild diffuse bulge, accentuated on erect images, with preservation of height. There is a very small midline annular fissure but no focal disc protrusion on supine images, but, on erect images, a large midline focal disc protrusion becomes visible, causing moderate central canal stenosis. Mild bilateral facet degenerative changes but no foraminal stenoses. L5/S1- Moderate degenerative disc signal reduction and mild diffuse bulge, accentuated on erect images, with preservation of height. There is a very small midline annular fissure with a very small midline focal disc protrusion. Mild bilateral facet degenerative changes but no foraminal stenoses. No change on erect images. Armed with additional imaging data, gained from making direct recumbent/upright MRI comparisons, clinicians can potentially correlate more accurately with their patient clinical data. This is especially so in more complex cases, where having maximum useful data should increase a clinician’s ability to correlate clinically. On the other side of the coin, the lack of correlation may actually add weight to the value of a functional/rehabilitation management approach over a structural/surgical approach for that particular patient. Kapellen P, et al. Imaging evaluation of low back pain: important imaging features associated with clinical symptoms. Semin Roentgenol 2010;45(3): 218-225. Giles L. 100 Challenging Spinal Pain Syndrome Cases (2nd Ed). Churchill Livingstone 2009. 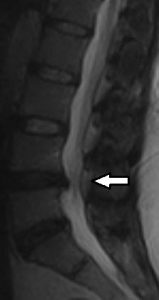 Sheehan N. Magnetic resonance imaging for low back pain: indications and limitations. Ann Rheum Dis 2010;69:7-11. Lee R, et al. Diagnostic capability of low- versus high-field magnetic resonance imaging for lumbar degenerative disease. Spine 2015;40(6):382-391.